Malaysia ditches plans for Singapore rail link. Is Chinese project next? Malaysia ditches Singapore rail link. Is Chinese project next? Malaysian Prime Minister Mahathir Mohamad at a press conference on Monday. Malaysia's new leader is ditching a planned high-speed rail link with Singapore that would have cost billions. The move raises questions about the country's commitment to other big infrastructure projects, including those being pushed by China. Prime Minister Mahathir Mohamad announced late Monday that the proposed rail link with Singapore would cost Malaysia a "huge sum of money." Analysts have put the project's total price tag around $17 billion. "It's not beneficial," Mahathir told reporters in Kuala Lumpur, questioning whether the rail line would ever be profitable for Malaysia or bring many benefits for commuters. Mahathir, the 92-year-old surprise winner of Malaysia's election earlier this month, is seeking to make good on a campaign pledge to cut back on big projects that risk increasing the country's high debt levels. He said the decision on the rail link is "final" but would take time to enact because of the agreement with Singapore. The government of Singapore said it hasn't received any notice from Malaysia about plans to scrap the project. Other big projects in Malaysia could be at risk, including a Chinese-backed plan to build a $14 billion rail link across part of the country. 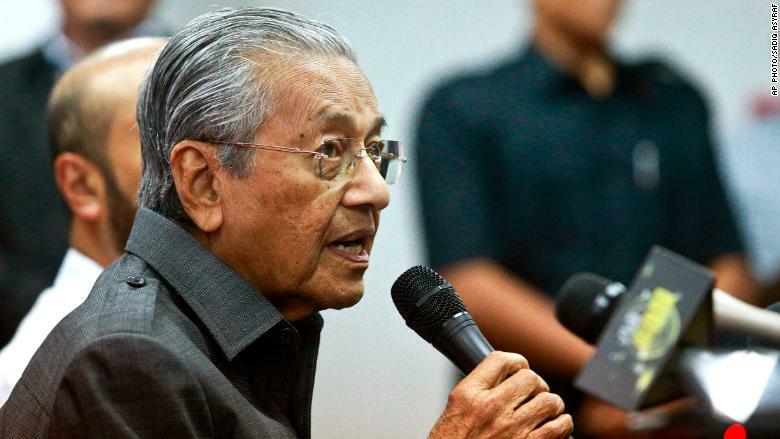 Mahathir told the Financial Times in an interview Monday that he wanted to talk to the Chinese government about renegotiating the project. His predecessor, Najib Razak, was a big proponent of China's Belt and Road initiative, a massive plan to pump hundreds of billions of dollars into ports, rail lines and other projects across Asia, Africa and parts of Europe. 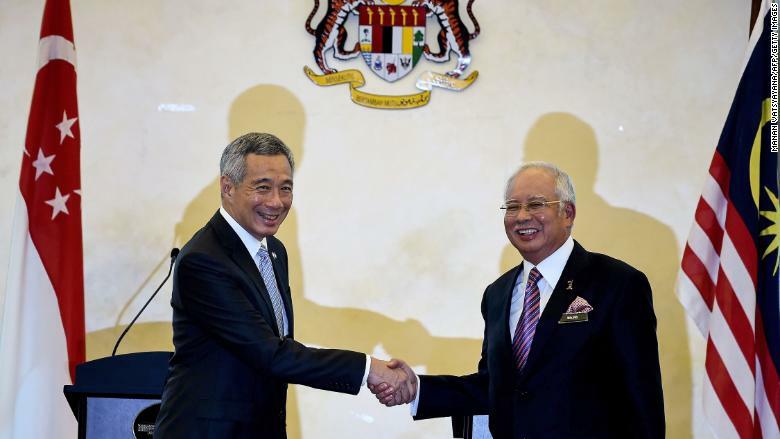 Singapore Prime Minister Lee Hsien Loong and Malaysian Prime Minister Najib Razak signed the deal for a high-speed rail link in 2016. Najib said earlier this year that Malaysia must "take advantage" of Belt and Road, "which has the potential to create the world's largest platform for economic cooperation." The country has signed up for an estimated $34 billion dollars worth of road, rail and port projects under the Chinese initiative, according to research firm Gavekal. But some experts fear Belt and Road projects may pile debt onto smaller countries and end up putting China in a strong position to influence their strategic decisions or even gain control of important infrastructure. Some of the Chinese-backed projects in Malaysia "are of dubious economic value" and axing them "may be no bad thing," said Alex Holmes, an Asia economist at research firm Capital Economics. In a note to clients on Monday, Holmes pointed to a Chinese-backed port in Sri Lanka that resulted in heavy losses and was eventually signed over to its Chinese creditors last year. Some experts think it's unlikely Mahathir will actually pull out of many of the big Chinese projects, though. "Most likely there will be some cosmetic changes to existing contracts, which in their essentials will proceed as before," Gavekal analyst Udith Sikand wrote in a note shortly after his election victory.